Inside: If you have ever wanted to learn how to make homemade churros, this is the article for you. Keep reading to learn how they are made and for a bonus recipe for a sweet piloncillo dipping sauce. 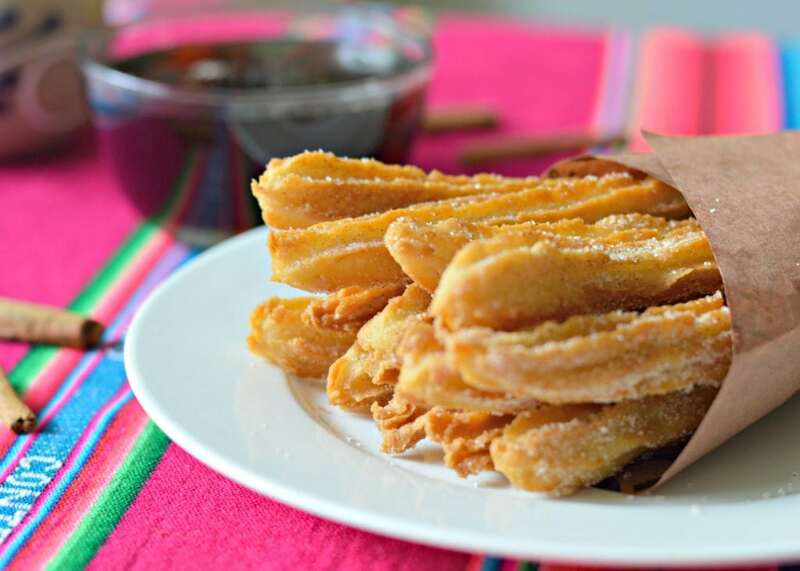 One of the oldest and most popular street foods in Mexico is definitely churros. This is a go-to recipe when your sweet tooth attacks, and today I am going to teach you how to make them from the comfort of your home. I have no doubt that you will love them! One of the ways that I try to keep my culture alive in my home is through the food that I prepare. That is why I try to incorporate Mexican flavors into my recipes on a daily basis. Occasionally, I spoil my family members by making some delicious Mexican desserts. The other day we were shopping at Costco, and like always, my boys asked me if we could get something to eat when we were done shopping. After looking at the menu, my oldest son asked if he could have a churro. I was so excited that he wanted to try something that I loved so much as a kid. I was also very excited to try churros again because it had been so long! Unfortunately, I ended up a little bit disappointed, since those churros lacked that special homemade touch that I was used to. When I got home, I called my grandpa right away and he gave me the recipe that I remembered so fondly from growing up in Mexico. Making churros really is simple, but still, you can’t compare the taste of homemade churros with those that come from a machine at a store. 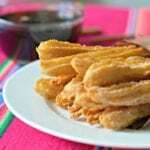 Churros are one of the most popular snacks in Mexico. One reason is that they come in different flavors and sizes, so there is something for everyone. I love churros that are stuffed and trust me, you can never just eat one. My favorite is the churros that are filled with a dulce de leche sauce, and I always used to buy some after getting out of school. Stuffed churros require a bit more work and even a machine sometimes because you have to hollow them out in the middle to add the filling. 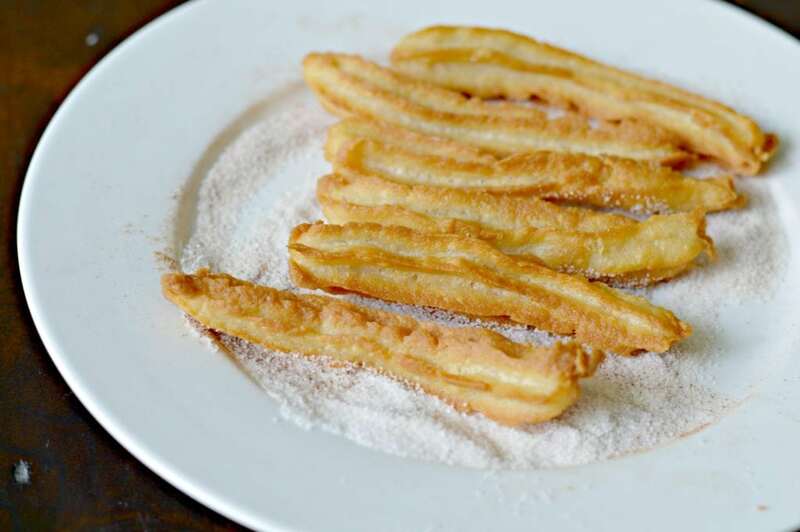 The basic concept of a churro is a homemade dough, which is then formed into a long cylinder shape, and then fried. The most common way to prepare them is to roll the freshly fried churros in a cinnamon-sugar mix and then to serve with chocolate sauce. That is the version that I am sharing below, with the difference being that I love to serve them with a homemade piloncillo dipping sauce. If you don’t know what piloncillo is, it is basically a variety of brown sugar, that is hardened and then formed into a cone shape. You can then melt it down and serve it in a variety of recipes. You can read more about it and buy it here if you are interested. How Do You Make Churros? 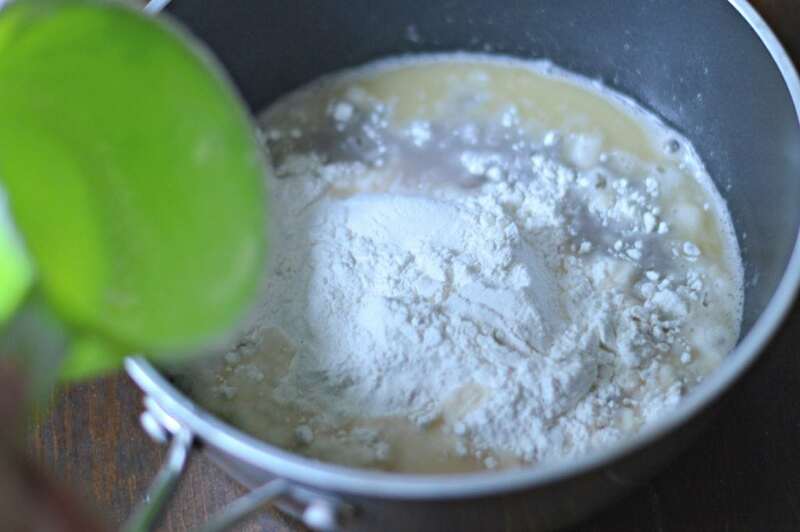 The process for making churros is simple. 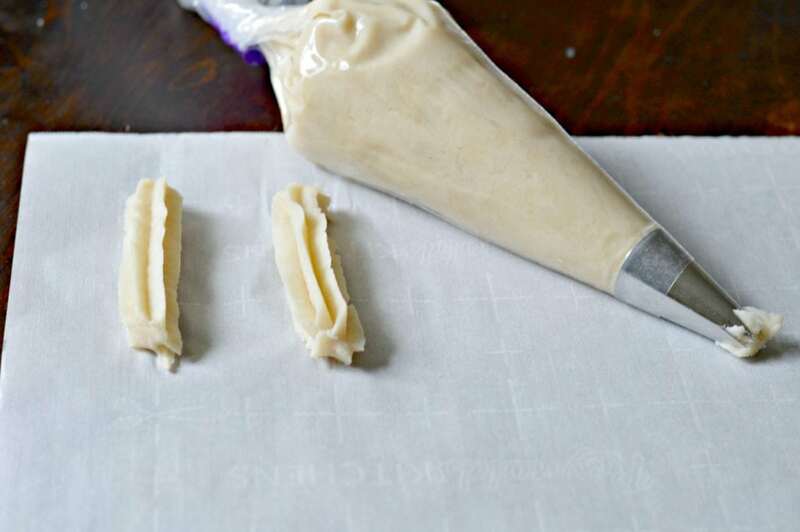 Next, you will put the dough in a pastry bag and then squeeze out to the desired length. 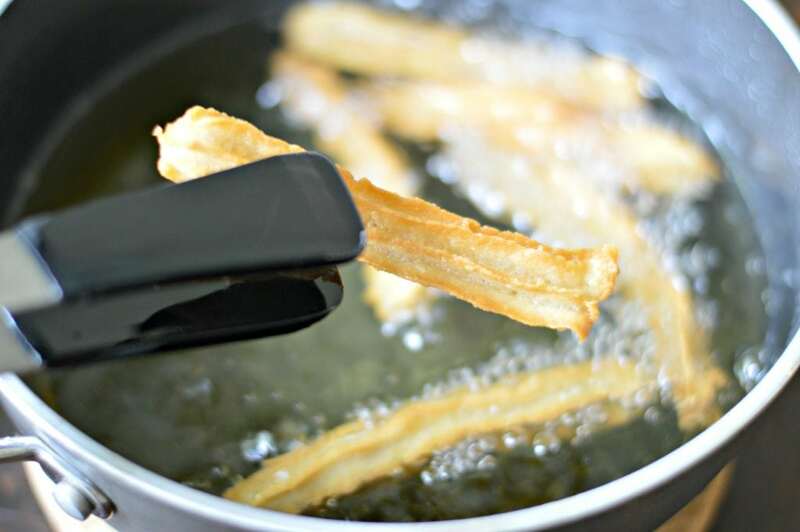 After you have the uncooked churros ready, you add them to a pot with hot oil, frying for approximately one to two minutes, turning about halfway through. The final step is to remove to a paper towel to get rid of excess oil before coating the recently fried churros in a cinnamon-sugar mixture. You can then choose if you want to eat them with a chocolate dipping sauce, or the piloncillo dipping sauce that is described above and in the recipe below. Some recipe call for adding eggs, but the version that I grew up making and enjoying didn’t include any. That isn’t to say that you shouldn’t do it, but hopefully having this eggless option is great for some of you as well. I hope that you love this recipe as much as I do, and don’t forget to leave a review below! 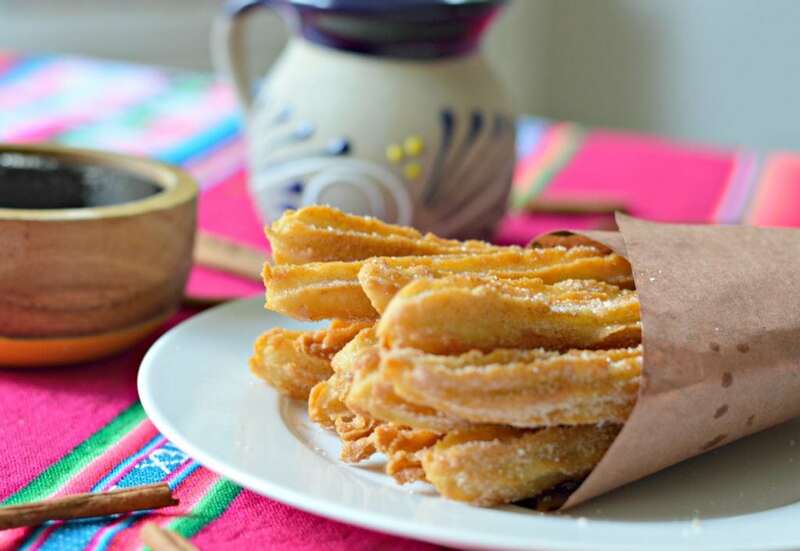 If you have ever wanted to learn how to make homemade churros, this is the article for you. Keep reading to learn how they are made and for a bonus recipe for a sweet piloncillo dipping sauce. Add the water, salt, butter, and cinnamon stick to a pot and bring to a boil. As soon as the water starts boiling, remove the cinnamon stick, and add the flour. 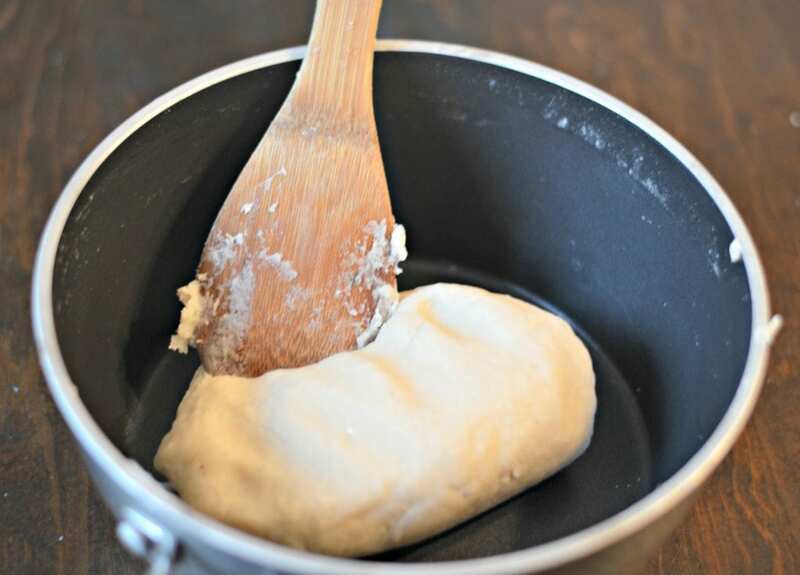 Remove from heat and stir rapidly until the dough is formed. Let Cool. 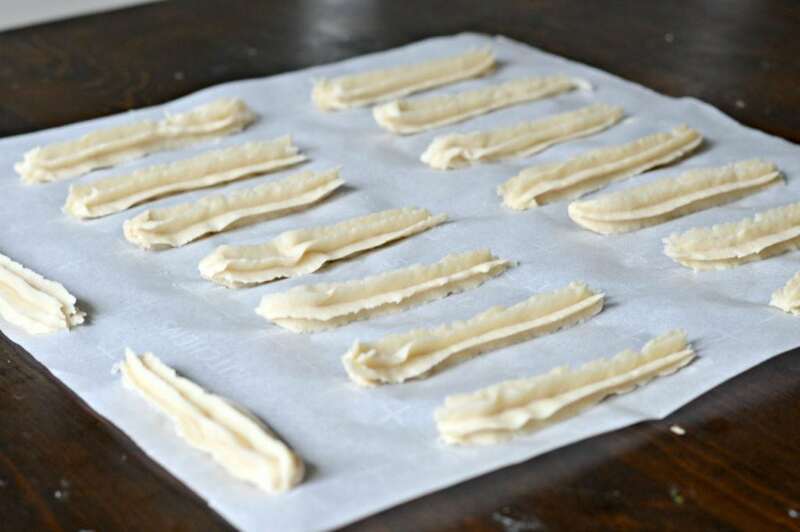 Once the dough is cooled, but still warm, add to a pastry bag with a star tip and begin to push the dough out to the length that you desire for your churros. You can use kitchen scissors to help you cut it off at the right length. Heat the oil and fry the churros, one or two at a time, until they are golden brown (about 1-2 minutes), turning them over once or twice during the process. Combine the sugar and ground cinnamon in a large bowl and mix well. Roll the recently fried churros in the cinnamon sugar mix, and serve immediately with chocolate or piloncillo dipping sauce. Add the piloncillo cones, the water and the cinnamon stick to a small pot and heat over medium heat until the piloncillo begins to melt, stirring constantly. Remove the cinnamon stick and reduce to low heat. Let simmer until it reaches the desired consistency. Remove from heat and serve with churros.